Steel frames are used in many commercial high-rise buildings, aswell as industrial structures, such as ore mines and oilrigs.Enabling construction of ever lighter and safer structures, steelframes have become an important topic for engineers. This book, split into two parts covering advanced analysis andadvanced design of steel frames, guides the reader from a broadarray of frame elements through to advanced design methods such asdeterministic, reliability, and system reliability designapproaches. This book connects reliability evaluation of structuralsystems to advanced analysis of steel frames, and ensures that thesteel frame design described is founded on system reliability. Important features of the this book include: * fundamental equations governing the elastic and elasto-plasticequilibrium of beam, sheer-beam, column, joint-panel, and braceelements for steel frames; * analysis of elastic buckling, elasto-plastic capacity andearthquake-excited behaviour of steel frames; * background knowledge of more precise analysis and safer designof steel frames against gravity and wind, as well as keydiscussions on seismic analysis. * theoretical treatments, followed by numerous examples andapplications; * a review of the evolution of structural design approaches, andreliability-based advanced analysis, followed by the methods andprocedures for how to establish practical design formula. 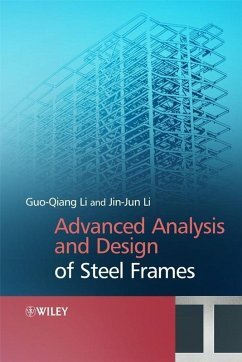 Advanced Design and Analysis of Steel Frames provides students,researchers, and engineers with an integrated examination of thiscore civil and structural engineering topic. The logical treatmentof both advanced analysis followed by advanced design makes this aninvaluable reference tool, comprising of reviews, methods,procedures, examples, and applications of steel frames in onecomplete volume. Professor Li received his PhD in Structural Engineering at Tongji University in 1988. That same year he started working at the University as a lecturer in Structural Engineering, and over the next six years he worked his way up to Associate Professor, and then Professor in 1994. His research interests lie mainly in the behavior and design of multi-storey steel buildings, the fire-resistance of steel structures and the dynamic identification of structures. He is an active member on the Editorial board of five International journals covering areas of research in steel and composite structures, structural engineering and materials, computational structural engineering, and advanced steel construction. He is the author of four books in Chinese, and over eighty research papers. Based Advanced Design of Steel Frames. References/Bibliography. Author Index. Subject Index.